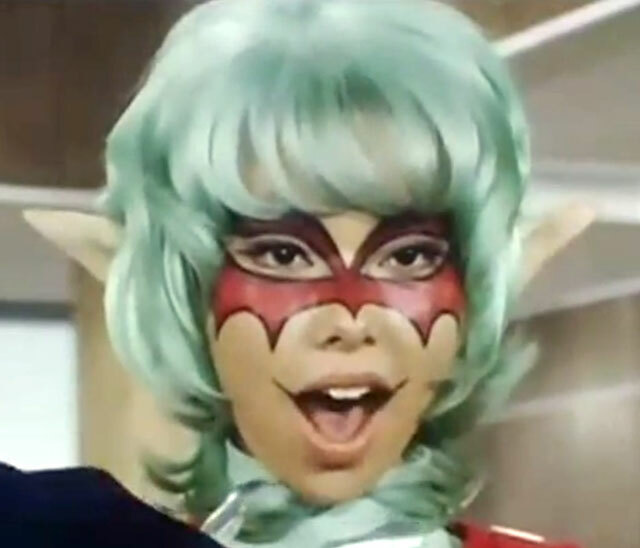 It’s sort of a delirious combination of the 1966 Batman series, Gatchaman, The Space Giants, James Bond and maybe Yo Gabba Gabba. I was checking out what was new in uploads to The Internet Archive when I discovered this gem. There are four episodes up there, and I hope there will be more. They are all in Japanese with no dubbing and no subtitles. I didn’t see a first episode with an origin story, but you get the drift during the title sequence. 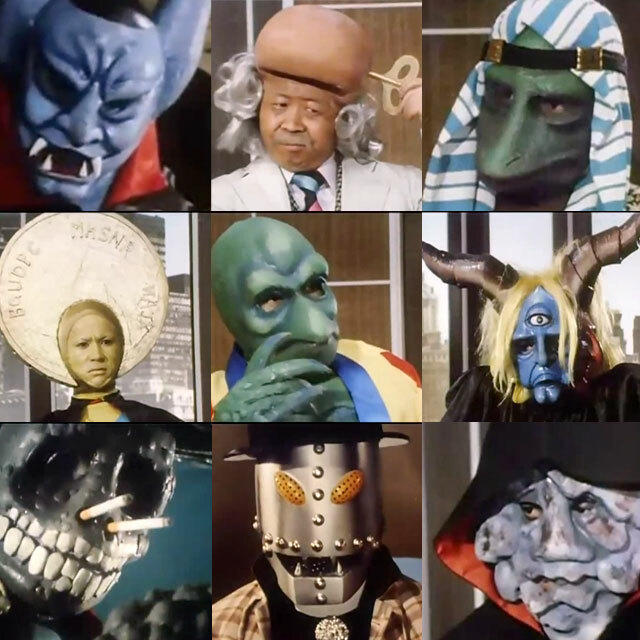 The best part of the show is the series’ roster of diabolical villains. They all meet in a board room similar to the members of SPECTRE in the 007 films. I like the calavera guy in the lower left with the cigarettes stuck in his nostrils, but my favorite is the Bat Lady. The guy has super powers and a yellow bird car which he drives around Japan dispensing justice and kicking the crap out of monsters. What more do you need to know? Watch this NOW! 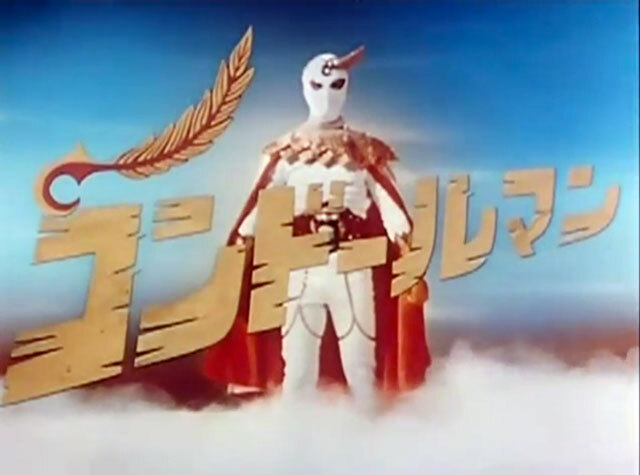 This entry was posted in Halloween, Movie Matinee, Stuff Joe Likes and tagged 1975, Condorman, Halloween, Japan, Karate, super-hero, television, Tokusatsu, villain. Bookmark the permalink. The bat lady is Red Baton. She had a sister who would prove to be much less impulsive and much more cerebral. Red Baton tried to destroy Condor Man but failed. The moment of her death was painfully-felt by her sister who was transformed into the much stronger Black Baton. At one point, the evil leader of the monsters got tired of their blunders and showed them what would happen. If memory serves me correctly, it opened it’s cloak and told the monsters to look inside. There, the Money Monster and Red Baton were chained to the ground and moaning as demons whipped them relentlessly. Black Baton started to cry for her sister and vowed to avenge her death. Good childhood memories. Thanks for the comment. I would have loved this show as a kid. Instead we had “The Six Million Dollar Man” which I’ve been catching up with on a nostalgia channel. I’m amazed at how awful and lazy the show was. 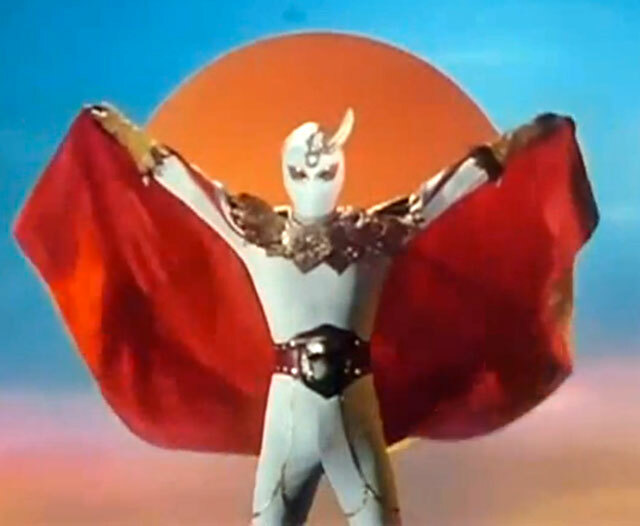 Nothing at all like the delirious energy of Condorman.